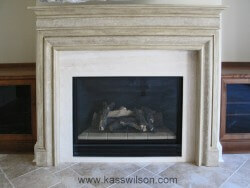 Fireplaces can be a wonderful addition to a home, offering warmth, a welcoming glow, and an instant focal point. Unfortunately many homes come with builder-grade mantels that don’t do justice to them, resulting in fireplaces that get lost on a large expanse of wall or look out of place with the other decor in the home. Faux finishes are the perfect way to solve these problems and transform a fireplace into the showstopper it deserves to be! In this living room, the white, builder grade fireplace surround and mantel didn’t relate at all to the gorgeous, rustic wood-beamed ceiling. 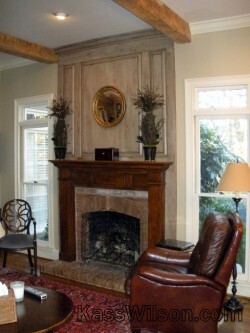 Faux finish techniques were used to create the illusion of two different types of wood– a pale, reclaimed wood surround and a rich, warm oak mantel. One of the joys of decorative painting is that your design possibilities are unlimited! 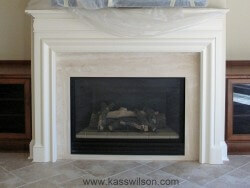 In this case, a plain, white fireplace mantel was transformed into stone through skillful faux finishing techniques. It’s hard to find a home that perfectly fits your interior design style- after all, style is personal! Instead, most of us have to buy the home with the best “bones”- or architectural features- and transform it into a setting that coordinates with existing furnishings and personal tastes. 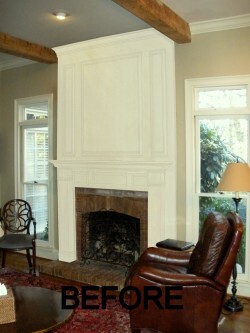 In this fireplace makeover, the stark white fireplace mantel and built-in bookcases were disconnected from the homeowner’s dark furnishings. 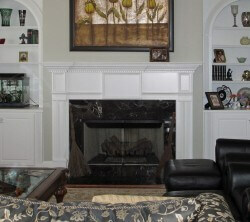 A creamy taupe and antiqued finish softened the bookcases and wall, while the fireplace received an ebony faux finish with bronze highlights, tying it to the dark sofas and other furnishings. 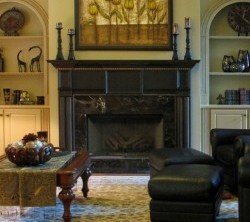 For more information on our Atlanta decorative painting services, contact us today.